Go read this post by Jeff Weiner, CEO of LinkedIn, titled: How to solve the other unemployment crisis. Yet there’s another massive labor imbalance in the country that rarely gets attention. According to the most recent report from the Bureau of Labor Statistics, there are over three million job opportunities going unfilled in the U.S. right now, the highest level in three years. How is that possible? Simply put, companies can find workers; they just can’t find the right workers. This situation is kind of a slap in the face to all you highly qualified unemployed people, right? Interesting perspective from this good-sized, now public company CEO. Why Isn’t There a Better Interface Between JibberJobber and LinkedIn? Last week someone deleted their JibberJobber account and said they wanted a better/tighter interface between LinkedIn and JibberJobber. We do have various access points between LinkedIn and JibberJobber, but it’s not enough. I’ve been asking LinkedIn for years for more and better access. HOWEVER, there was one really, really, really big HOWEVER. While the technology is in place to have a better, tighter interface, the LinkedIn terms of service will not allow us to do what we want. LinkedIn’s position is that the data in LinkedIn is THEIR data, and no third party system (like JibberJobber) is allowed to take the data out and put it elsewhere. In other words, we can’t do a one-click synchronization. We can’t have a browser toolbar that allows you to scrape data from a LinkedIn user profile. Even if you are a First Degree Contact, which means the other person agreed to be connected with you, you are not allowed to take the data from their Profile and put it anywhere. There is a term: storable data, that makes a lot of what YOU want to do impossible. Technically, it’s possible, and easy. Legally, it is not possible. We could fudge it and just do it, however (a) that would be wrong of us, and (b) if LinkedIn found out YOU used a tool to break their rules, they might penalize YOUR account. And I don’t want to be responsible for your LinkedIn account getting penalized (disabled). If you are interested in more information on this issue (which is not uncommon), see this very good powerpoint. Comments Off on Why Isn’t There a Better Interface Between JibberJobber and LinkedIn? Yuck. You could make more from an illegal lemonade stand! 1. We finally, finally, finally got our new server in place. We debated going strictly “cloud,” or getting a new box, or just milking all we could out of our existing box. After various considerations we decided to get a brand new server. A few weeks ago it arrived and was prepared for the big move… on Wednesday morning in the wee morning hours the change was official. Result: You should see a significantly faster JibberJobber. We have, and we hear good things from users. 2. We have added a new job board aggregator to the experience. On a company or job posting page, you’ve seen the “related jobs” section where you would see links to related jobs. These were provided by Indeed. Now there is a tab for Indeed and another tab for LinkUp. We’ve been asked to provide a link to LinkUp, which we now have. Jobs from LinkUp should only come from an employer website… in other words, they spider employer websites (not other job boards or aggregators), so the probability that the jobs posted are REAL jobs should be higher. See this page for more on LinkUp jobs. They say they are “always current,” often unadvertised,” and “never fake.” That sounds good to me! Result: More relevant jobs, supposedly from a more trusted source. Our “to do” list is still a mile long… if you have any specific requests please let us know. Before I lost my job I was, like many in the U.S., living paycheck to paycheck. Thank goodness for an overdraft, which we used quite a bit. I made just enough to not have to be very strict with my finances, even though we had hardly any savings to show for it. It was kind of a sloppy way of managing finances. Then, I lost my job. Managing finances was different. What I learned was that if you make gazillions, you don’t have to think about it. If you make NOTHING, you don’t have to think about it (because there are no decisions to make about where to send the extra… there is never extra nothing :p). We still had some serious expenses. While I was unemployed my wife had a baby, and then a surgery. In the past we would do what our insurance company told us to do. But without insurance, it is different. What we learned was we could negotiate with the hospital and pay 50% LESS than before (as long as we paid the 50% in cash, before we left). Did you know you could save thousands on a hospital bill? We never cared to know, but once our finances changed, we CARED! Here’s another thing I learned. After my business started making some money I decided to do something I had always wanted to do: I paid $400 extra on my mortgage. I thought that $400 would pay down principal, but apparently I did it wrong, and they only applied it to interest. I felt cheated. I spent time on the phone with the mortgage company and learned there is a special address to send additional payments to. I have since sent additional payments there, and am seeing my overall amount owed go down. I learned that an extra payment isn’t really an extra payment unless you do it right (which means pick up the phone, call them, ask them how to “do it right.”) That was a few years ago and I’ll still jaded from them stealing my $400 and applying it to the wrong place!! Recently, I’ve started to put 10% of my earnings into a special savings account. For a long time I haven’t felt like I had the money to do this… but what I learned is that I do have the money to do this. It’s better to save a bit and live within the rest than it is to continue to live “paycheck to paycheck” and never “get ahead.” It has taken discipline to save the 10% but it has been rewarding to see the savings grow over the last few months. For too long my finances have just kind of happened, but I’ve decided to take charge of them and be much more intentional about what I’m doing. I remember someone at a job club a few years ago saying that if we were more careful with how we spent money we would not be in so much pain when we lost our jobs. It’s a hard truth to swallow, but it’s true. Tomorrow I fly to Oakland, and will do my first of nine presentations in that area. I’m really excited to go back, under special circumstances (helping EU celebrate a major milestone in their history). Are you in the San Francisco, East Bay or Silicon Valley area? If so, please come! Please let your contacts know about my trip – it will be a while before I’m in the area again! You’ve asked (and asked and asked and asked) for an evening webinar. When you ask I send you a link to the archived webinar. But you still ask for an evening webinar. So, I finally, finally scheduled one. Depending on how many people come we might do this again. On September 20th, Tuesday, at 5:30 MST (do the math if you are not in mountain zone), we’ll have our webinar. And I’ll go as long as I need to (usually that means 90 minutes). 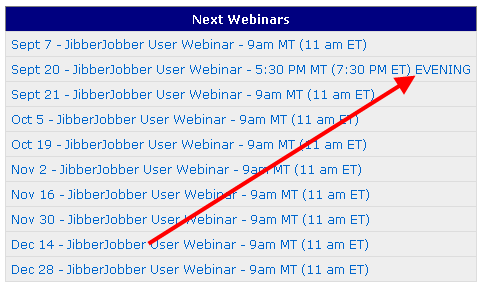 Click on the image below and find the webinar you can attend. The evening one is on Sept 20th. Want JibberJobber News in your Email? I am getting better at sending out regular “newsletters,” having recently switched from traditional newsletter technologies to simply using my JibberJobber Career Management Group on LinkedIn. If you are interested in getting these “newsletters,” which cannot be sent more than every eight days (I’m probably averaging once every three weeks – they are very short), you can sign up here. If you want to join my LinkedIn Group and get these announcements, click here. JibberJobber was about three years old when, one day, I got a bunch (A BUNCH) of new signups from New York City. They said they came from NBC. When we say that there were cheers of elation, and perhaps some fainting. I think this was the first major TV exposure we had. I was indebted to Sree for finding JibberJobber and mentioning it to the millions of viewers. 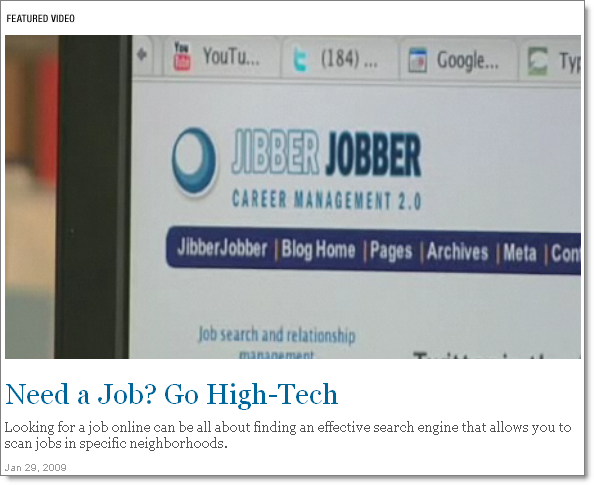 Here’s an image, which goes to the video, called “Need a Job? Go High-Tech“. Are You Cheating On Your Job Search? Sunday I was talking with a fellow business owner, and we were chatting about working out. I said that it’s easy, as an entrepreneur, feel like you are cheating on your company when you do other stuff. Like work out. This is a hazardous mentality that I brought from the first days of my job search. When I started looking for a job I was very, very hungry. I didn’t want to rely on my family for help with bills and food. I didn’t want to rely on my church for help with bills and food. I didn’t want to rely on the government for help with bills and food. All three were there, and ready to help. And they did help, and it was hard to take their help, but that’s for another post. I was hungry. I wanted to be on my own two feet. I wanted to be independent. I worked very hard on my job search (not necessarily smart). I didn’t do anything else. I let my marriage go on the back burner, I let my physical fitness go on the back burner. If I had a shred of energy or mental bandwidth, it was dedicated to my job search. I thought this was going to be a short-term thing, and then I could let life get back to normal. And letting those things go was a mistake. What I’ve learned in the last 18 months is that I need to take time, and pay attention to my wife, and my kids, and my home, and my lawn, and my body, and my finances, and my spirituality, and my _________ (whatever else I was neglecting). Today I am going on my 3.2 mile walk. In the time it takes to do that I might be able to do a LinkedIn profile critique. I might be able to write 3 blog posts. I might be able to do a number of billable things. But I can’t. Because what I’ve really learned is that I’ve been cheating myself by letting this one grand thing (my business… for you it might be your job search) get in the way of having the life I really want, and the health I really need.